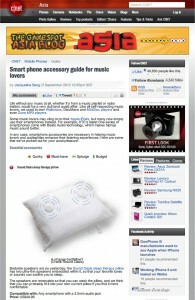 Visit Gadget Review to read their review! 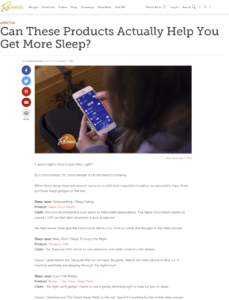 Rachael Ray: Can These Products Actually Help You Get More Sleep? 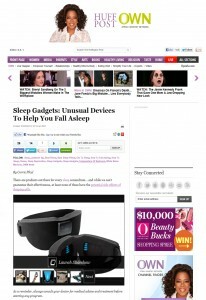 This high-tech gadget claims to use a gently dimming light to help lull you to sleep. As someone who frequently travels, I'm no stranger to sleep masks. This one effectively blocked out the light. I feared being distracted by dulling blue lights, but they really did help me focus my brain on something other than random thoughts. I’m a huge fan of the Sound Oasis BST-400 Stereo Bluetooth Sound Therapy machine because of its versatility and rich, authentic sounds. It’s a worthy investment. 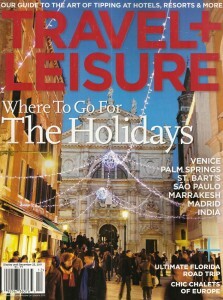 WHETHER HIS JOB or his family forces him to travel, we know escapism can be a favorite among our fathers' hobbies. So it's up to us to make sure that if he must leave, he does so in style. Your mother always put you to bed and helped you wake in the morning. Now you can repay her with this comfortable sleep mask that uses gently dimming light to help her fall asleep and gently brightening light to help her wake up naturally. Congratulations--someone you love is having their first baby! 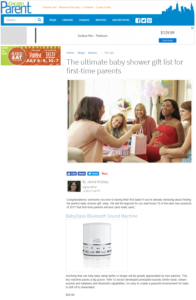 If you’re already stressing about finding the perfect baby shower gift, relax. 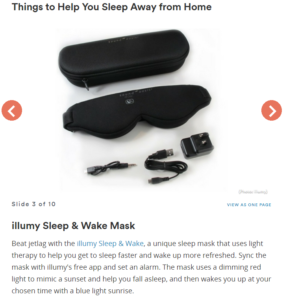 "Beat jetlag with the illumy Sleep & Wake, a unique sleep mask that uses light therapy to help you get to sleep faster and wake up more refreshed." Earlier this year Mr O'Loughlin visited Australian Hearing in Grafton and as a veteran was fitted with a hearing aid for his left ear and a Sound Oasis Therapy System to relieve his tinnitus. There are soothing sounds galore, including rain, waves, crickets, wind chimes and bird chirps, but sometimes white noise can be the most uncomplicated and relaxing. 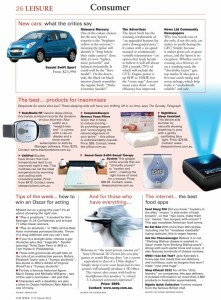 Launched last month, the S-100 White Noise Machine by Sound Oasis offers 10 white noise tones in a compact, portable design that also doubles as a speaker, should you wish to play sleep-inducing music with your mobile device. $59.99 at sound-oasis.com. Want to listen to relaxing music without wearing uncomfortable headphones? Invest in the Sound Oasis Sleep Therapy Pillow, which features two high fidelity, ultra-thin stereo speakers positioned deep inside of it. The $50 pillow also includes in-line volume control, a 3.5mm plug that fits into a standard audio jack and the option to remove the speakers so that you can machine-wash or hand-wash it. 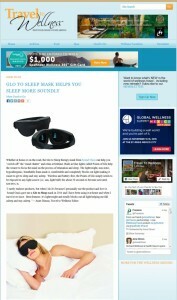 Glo to Sleep is a therapy mask that encourages better sleep sessions without the use of drugs. 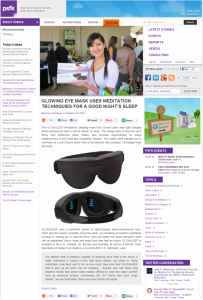 Great for insomniacs and those with less serious sleep issues, this eye cover uses a patented system of light-charged photo-luminescent bars that help induce deep sleeps. 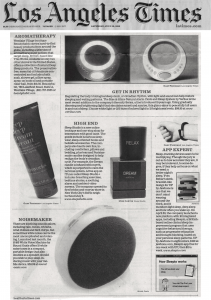 In an era when slumber can be elusive, The Sound Oasis Co. has launched the Sleep Therapy Mask as a way to help consumers quickly relax and get to sleep naturally. 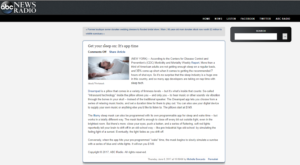 Consumers using the Sleep Therapy Mask simply charge the Points of Glo incorporated into the product under a light for about 30 seconds then follow the fading of a gentle blue illumination to sleep. 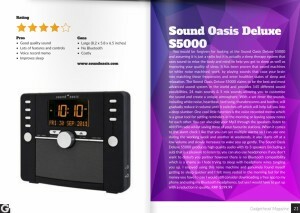 The Sound Oasis Deluxe is the best, most advanced sound conditioner in the world! Combining unsurpassed, high fidelity sound reproduction with an exceptional offering of sound the Sound Oasis Deluxe allows users to create their very own sound environment conducive to relaxation, sleep and improvement of everyday life. 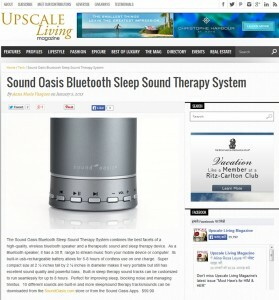 By bathing a room with authentic sounds of nature or the proprietary ‘bio-sync' sound (developed by the world renown sound therapy expert, Dr. Jeffrey Thompson), Sound Oasis Deluxe blocks out irritating noises and creates a peaceful atmosphere so users fall asleep easier, get higher quality sleep, enhance concentration, and feel more alert throughout the day! 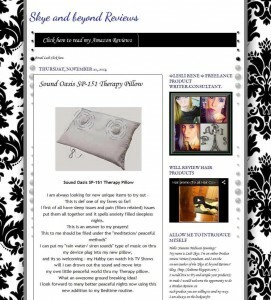 Snuggle down Lay your noggin down and sing yourself to sleep with this fluffy wonder, the Sound Oasis Sleep Therapy Pillow. 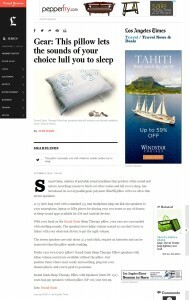 Two high-fidelity, ultrathin stereo speakers are buried deep into the pillow's core. 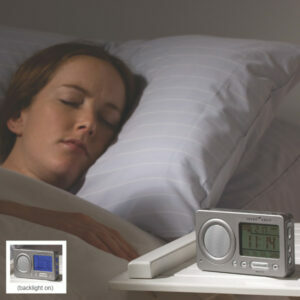 Plug in any 3.5 mm plug compatible iPod/MP3 player, CD player, television or radio and let the snoring begin. 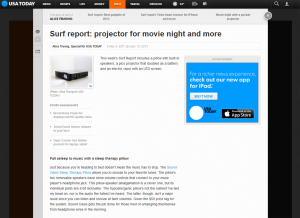 Inline volume control. 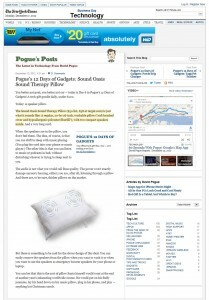 Remove speakers to wash pillow, 20 inches by 26 inches, made of hypoallergenic polyester fiberfill. Technology so new, patent is pending. $49.99 But, say you have a special pillow (like Goddess!). 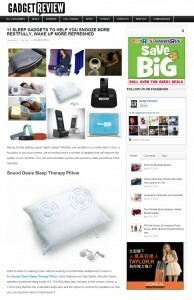 Sleep Therapy Pillow Speakers turn any pillow into a sleep-therapy pillow. Place under pillow and crank up the Dean Martin, Don Ho or whomever you like to sing you to sleep. $22.99. You'll find these goodies and more at www.sound-oasis.com. Prefer your own trusty pillow? 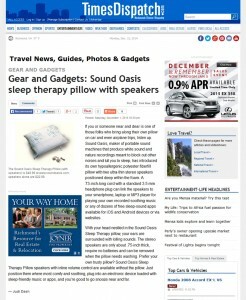 Sound Oasis Sleep Therapy Pillow speakers with inline volume control are available without the pillow. 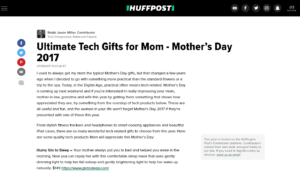 Just position them where they are most comfy and soothing, plug into an electronic device loaded with sleep-friendly music or apps - perhaps even a gentle but insistent alarm clock app, and you are good to snooze, near and far. If you like to bring along your own pillow when travelling, even during airplane trips, go for the Sound Oasis hypoallergenic polyester fiberfill pillow. It has two ultra-thin stereo speakers positioned deep within the foam. A 73-inch-long cord with a standard 3.5 mm headphone plug can link the speakers to your smartphone, laptop or MP3 player for playing your own recorded soothing music or any of dozens of free sleep-sound apps available for iOS and Android devices or via websites. 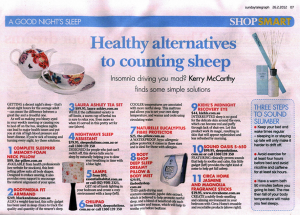 With your head nestled in the Sound Oasis Sleep Therapy pillow, your ears are surrounded with lolling sounds. The speakers have inline volume control so you don’t have to tinker with your electronic device to adjust the perfect volume. The stereo speakers are only about .75-inches thick, require no batteries, and can be removed when the pillow needs washing. 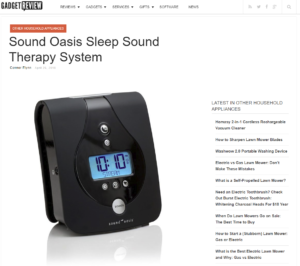 The Sound Oasis Bluetooth Sleep Sound Therapy System combines the best facets of a high-quality, wireless bluetooth speaker and a therapeutic sound and sleep therapy device. As a Bluetooth speaker, it has a 30 ft. range to stream music from your mobile device or computer. Its built-in usb-rechargeable battery allows for 5-8 hours of cordless use on one charge. 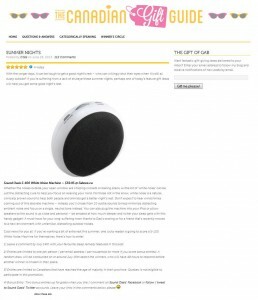 The Sound Oasis Bluetooth Sound Therapy System is a tiny speaker that comes preloaded with soothing sounds that will help you relax; imagining the beach and the ocean is a lot easier with the sound of the beach sitting on your desk. Once I realized what the cause of my sluggishness was, I turned on the Bluetooth mode and was surprised at how nice the sound quality was listening to my music collection. The moral of this story: The Sound Oasis is a great compact speaker that has the ability to put you to sleep or rock you out to get some work done. 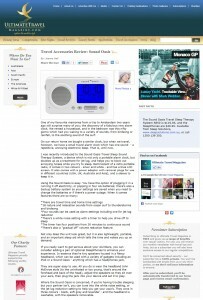 The Bluetooth Sleep Sound Therapy System is a sound machine and Bluetooth speaker in one compact package. I am in no way a genius when it comes to technology, but it only took me minutes to have the system up and running... What makes this special for me is it not only has 10 built-in nature sounds, it also allows you to stream music through the device, making it multi-functional for travel. 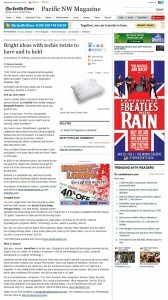 There is Sound Oasis Sleep Therapy Pillow Speakers with volume control, thin stereo speakers that you place under your pillow to envelop your head with music or white noise from your digital device (from about $22 online), though when it comes to blocking noise, nothing can beat the Tranquil Moments Bedside Speaker & Sleep Sounds device from Brookstone ($99.99). It has got a dozen sound programmes (including "ocean surf" and "white rain") and refined volume control that you can bump up bit by bit until you've masked the chatter of hotel room neighbours, voices in the hallway and, outrageously loud snoring from an adjacent room. I like Sound Oasis Sleep Therapy Pillow Speakers with volume control, thin stereo speakers that you place under your pillow to envelop your head with music or white noise from your digital device (from about $22 online), though when it comes to blocking noise for me, nothing can beat the Tranquil Moments Bedside Speaker & Sleep Sounds device from Brookstone ($99.99). It’s got a dozen sound programs (including “ocean surf” and “white rain”) and refined volume control that you can bump up bit by bit until you’ve masked the chatter of hotel room neighbors, voices in the hallway and, as I can attest, outrageously loud snoring from an adjacent room.